On Wednesday 21st March sixty-one of our team members travelled from far and wide to take part in our first Tribes National event of 2018…and it was a-MAZE-ing! 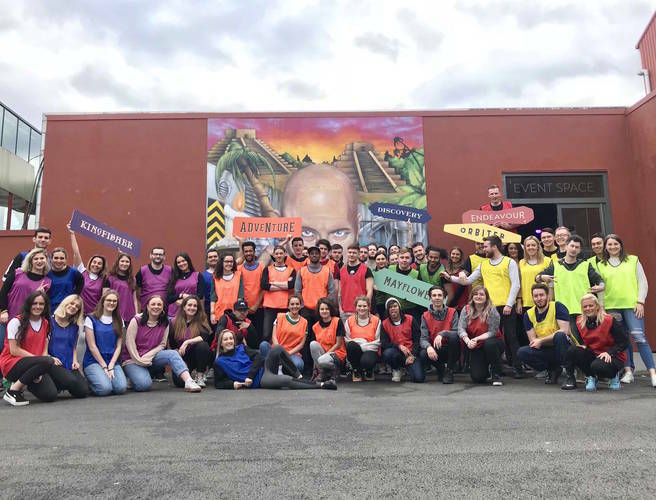 The teams met up in Manchester at The Crystal Maze Live Experience where we organized a private hire of the entire venue, to host an exciting day of exhilarating challenges to encourage some healthy competition and let our teams have some good ol' fun! They were greeted by the eccentric Crystal Maze “maze masters” who were “insane and each had their own unique character but the passion was strong”. They led our teams into the maze with bundles of enthusiasm and excitement and really created a realistic and enthusiastic atmosphere. After a full health and safety meeting, our teams were grouped into their tribes and given their coloured bibs. As soon as the bibs were quickly pulled over their heads, a palpable sense of competition and ambition to win was unleashed! With everyone ready and rearing to go, the teams were given instructions and before you could say, “It's about the taking part that counts” they were off like rockets. The teams needed to collect as many crystals as possible from the different zones to earn extra time in the final dome. At the end of the maze there was the crystal dome, which was just like TV! The teams cheered on and watched from the sidelines as each team were bundled in and frantically attempted to grab flying gold tickets, the one with the most would win. Everyone was in really high spirits and there were no sore losers, which was admirable! The champion tribe for the day who completed 4 zones, with a total of 10 Crystals, 237 Tokens in the dome was...MAYFLOWER!!! They earned their entire tribe 600 Tribes points and were awarded the engraved Crystal trophy, organized by our Tribes Elder, Tamara Johnson, who described it as an “INCREDIBLE day”. We are thrilled that everyone enjoyed our first Tribes event of the year. We can’t wait to catch up with more of our teams as they take part in more challenges to earn our Tribes even more points! To see some more pictures from the day click here.